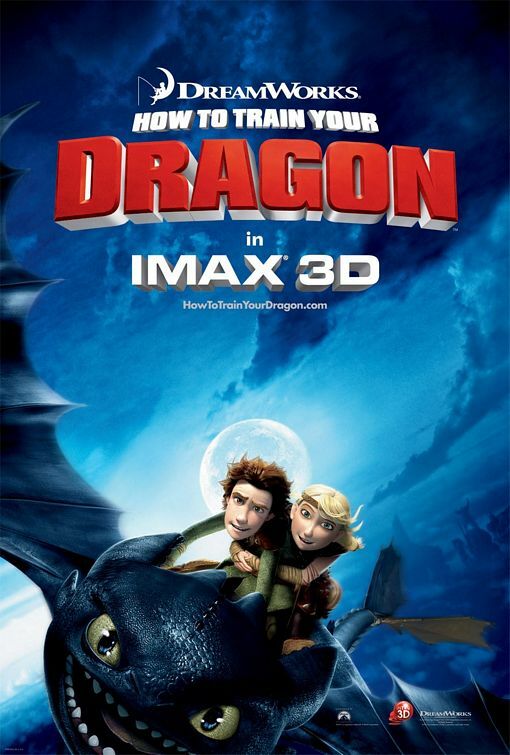 How to Train Your Dragon (2010) | Tales From The Ipe! I elected to take Thursday and Friday as vacation days this week. Historically, I’ve been terrible at taking vacation days timely, so I want to rectify that situation this year. I’ve realized that vacation time taken at the right times throughout the year is necessary for recharging the mind and body. Early Thursday morning, I took Lily at 7am to Quest Diagnostics for some bloodwork. She did fairly well — she didn’t cry initially when the needle went in, but it was a slow boil until she really started crying. She calmed down quickly afterwards. At lunch time, I picked up Josh from school and we drove to Princeton to meet up with Nums for lunch. There’s a decent Indian restaurant across the street from her office, so we sat on the rooftop patio, and enjoyed an Indian buffet. Beautiful weather today. After lunch, we drove to Hamilton, NJ, to get me a quick haircut, and then see a 2pm showing of How to Train Your Dragon, a Dreamworks animated film available in 2D and 3D. I initially wanted to take Josh for the 3D version of the film, but given that the next 3D movie showing was a few hours away, I didn’t want to waste too much daylight. In hindsight, the 2D version was just as enjoyable. I think Josh especially loves the popcorn. Even after enjoying hearty Indian buffet, he still had room in his 5-year old belly for a small bag of popcorn. Oh, and the bottle of water I snuck in. Yeah, I snuck in outside food. Why should I pay $4 for a bottle of water? Every preview shown before the movie was another upcoming 3D movie. Looks like there will be many 3D movies released this year. However, how do you get around the cost? The two tickets for an adult and child-under-12 on a quiet Thursday afternoon cost $16.50. I asked how much would be an adult 3D ticket, and it was $13.50. Waiting for the 3D showing would have cost me an extra $10. That’s a lot of money, IMHO. As I mentioned, the movie itself was enjoyable. The story was good, not as predictable as I thought, and the animation was very nice. I liked the characters, and the star dragon (“Toothless”) was very catlike. I liked it. To wrap up the day, we had time for Joshua to catch a make-up gym class at 6:30pm. We had leftovers for dinner, and the kids were off to an early bed. We parents were so tired, we went to bed around 10pm. I’m not a fan of going to bed early, but when you are that tired, you just gotta let it go. 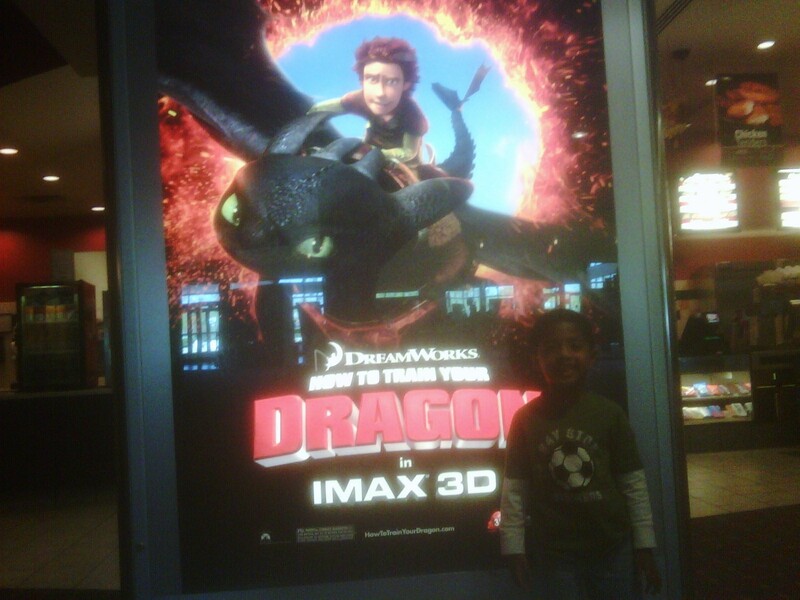 This entry was posted in Entertainment, Family, Personal and tagged animated, dreamworks, joshua, movies. Bookmark the permalink.